For event photos after 2016 click here. The Iowa Association for Justice convention was held November 10-11, 2016 at the Marriott Downtown Des Moines. IAJ installed new officers and board members, honored its 2016 award winners and collected more than $2,800 in donations to the DMARC food bank as part of its Justice In Deed initiative. 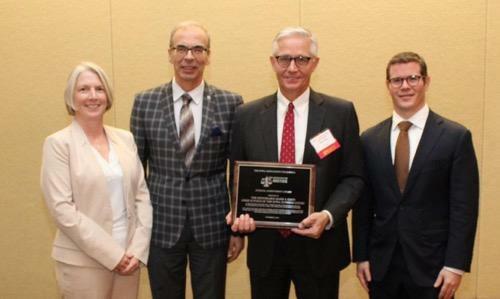 Pictured to the left is Chief Justice Mark Cady, winner of IAJ's 2016 Judicial Achievement Award, with Molly Kottmeyer, Tim Bottaro and Brian Galligan. Follow this link for all photos from the event. The Iowa Association for Justice held its annual two-day seminar November 5-6, 2015 at the Marriott Downtown Des Moines. At the event IAJ installed new executive officers and members of its Board of Governors. 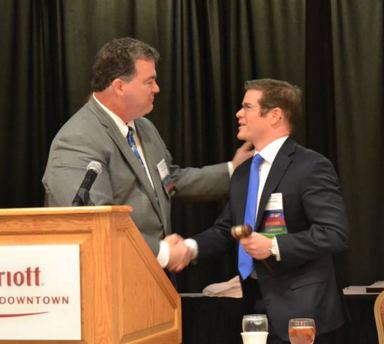 IAJ’s newly installed leaders will serve the 2015-16 term. IAJ also honored its 2015 award winners and collected over $2,500 in donations from Iowa trial lawyers for Youth Emergency Services and Shelters as part of its Justice In Deed initiative. Follow this link for photos from the event. 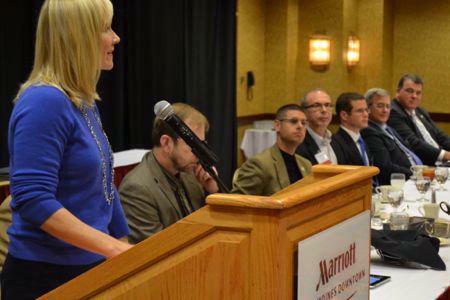 The Iowa Association for Justice held its annual two-day seminar November 6-7, 2014 at the Marriott Downtown Des Moines. 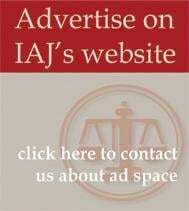 At the event IAJ installed new executive officers and members of its Board of Governors. IAJ’s newly installed leaders will serve the 2014-15 term. IAJ also honored its 2014 award winners and completed its year-long Justice In Deed fundraising campaign to place a fully trained therapy dog at On With Life in Ankeny. Follow this link to see full photos from the event. In September 2014, IAJ's 41st President, Elaine Gray, had board members to her home in Montrose, Iowa for her president's outing. That same day the group met at a Ft. Madison park to clear away trash and debris as a Justice In Deed project. 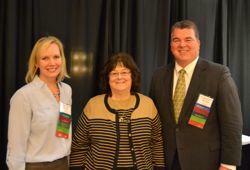 The Iowa Association for Justice held its annual two-day seminar November 7-8, 2013 at the Marriott Downtown Des Moines. At the event IAJ installed new executive officers and members of its Board of Governors. IAJ’s newly installed leaders will serve the 2013-14 term. IAJ also honored its 2013 award winners and donated to a local charity though its Justice In Deed community service initiative. Follow the link above to see photos from the event. October 11, 2013 - As part of its Justice In Deed initiative, trial attorneys with the Iowa Association for Justice (IAJ) gathered for a service day at On With Life in Ankeny. Trial attorneys from across the state helped build a wheelchair accessible dock on the campus pond, they built a retaining wall and finished a gazebo for the people served at On With Life. On With Life is a Midwest leader in brain injury rehabilitation. Trial attorneys with IAJ often represent victims of traumatic brain injuries following catastrophic accidents. On With Life serves these very same people on their road to rehabilitation. Follow the link above to see photos of IAJ members hard at work. September 26, 2013 - IAJ members, past presidents and friends met at the Iowa State Historical Building in Des Moines to celebrate 40 years of protecting rights and righting wrongs. This was truly a night to remember as party-goers enjoyed great food, a video featuring legendary IAJ leaders, past and present, and an unforgettable dueling pianos group (Deuces Wild) that had everyone on their feet. Follow the link above to see photos of IAJ's 40th anniversary celebration. Follow the link above for a slideshow of IAJ's 2012 Annual Convention. Photos include IAJ's new president, Pressley Henningsen, members and convention award honorees. For a complete list of IAJ convention results click here. Results include all newly installed officers, elected members of the board of governors, award honorees and Justice In Deed partners. 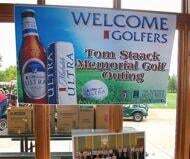 In September, 2012 IAJ held its Tom Staack Memorial Golf Tournament. As a fundraiser for the Cedar Valley SportsPlex Endowment Fund, proceeds from this tournament will provide underprivileged area youth with a safe facility to exercise and play organized sports. IAJ organized this event to remember its late president, Tom Staack. 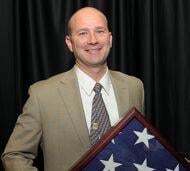 Tom was a leader in the Cedar Valley community and in the legal community. As a partner with the Dutton, Braun, Staack & Hellman law firm in Waterloo, Tom fought for Iowans who fell victim to negligence and abuse. Unfortunately, he was lost to cancer in March of 2012. Tom was a tremendous athlete with a long history of service to his community, so this fundraiser is a fitting way to honor his memory. IAJ members volunteered their time with the Greater Des Moines Habitat for Humanity. Three teams of workers' compensation attorneys from across the state (and some of their staff members and family) installed siding and did other finish work on three neighboring Des Moines homes. These attorneys also pitched in to donate over $3,000 to the Greater Des Moines Habitat for Humanity as part of the service project. IAJ once again partnered with Martin Luther King, Jr. Academy in Des Moines for a Justice In Deed winter clothing project. Follow the link above for to see photos from the project. Trial attorneys with IAJ generously donated new and gently used winter coats, hats, and mittens at IAJ's 37th Annual Convention. Donations were placed around a Christmas tree in the convention hall and King Academy Principal Thomas Simmons attended the event to accept the donations. IAJ looks forward to a continued partnership with the school and its fantastic students. Follow the link above for a slideshow of IAJ's 2010 Annual Convention. Photos include IAJ's new and immediate past presidents and convention award honorees. Follow the link above for a slideshow of IAJ's August 2010 service day. IAJ members volunteered their time on August 13th with the Greater Des Moines Habitat for Humanity. Two teams of trial lawyers from across the state performed finish work on two Des Moines homes. 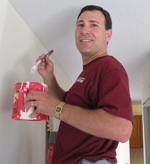 This work included painting, hanging doors, building a retaining wall, trim work, installing cabinetry, clean-up ect. 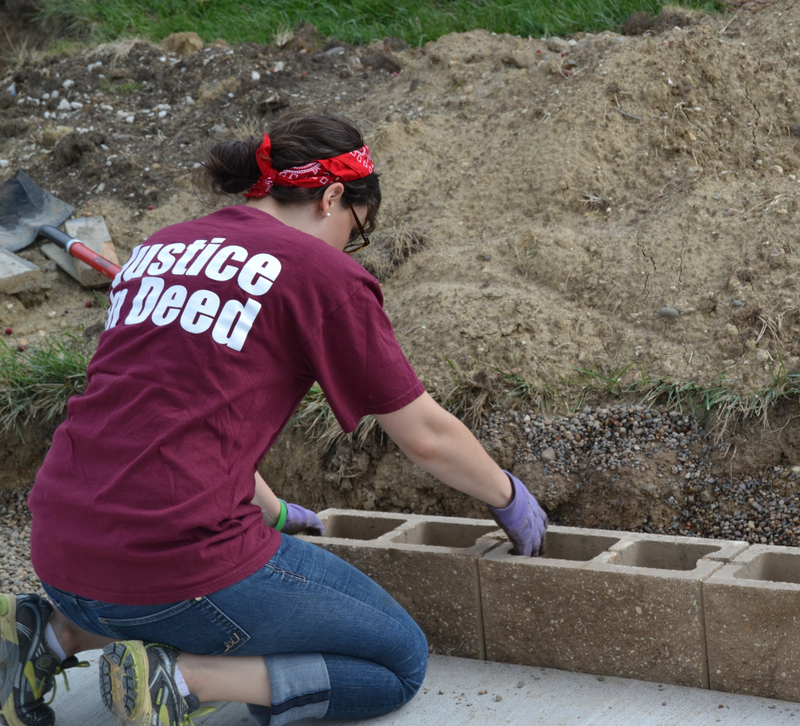 The day-long service project was part of IAJ's Justice In Deed initiative. Follow the link above for a slideshow of IAJ's February 2010 Justice In Deed Winter Clothing Drive. While attending the annual Workers' Compensation Seminar, IAJ members donated new and gently used winter coats, hats, and mittens for Des Moines-area children in need. The generous donations from this clothing drive were delivered to Martin Luther King Jr. Elementary School in Des Moines. Follow the link above for a slideshow of IAJ's 2009 Annual Convention. Photos include IAJ's new and immediate past presidents, convention award honorees and IAJ members enjoying convention festivities. 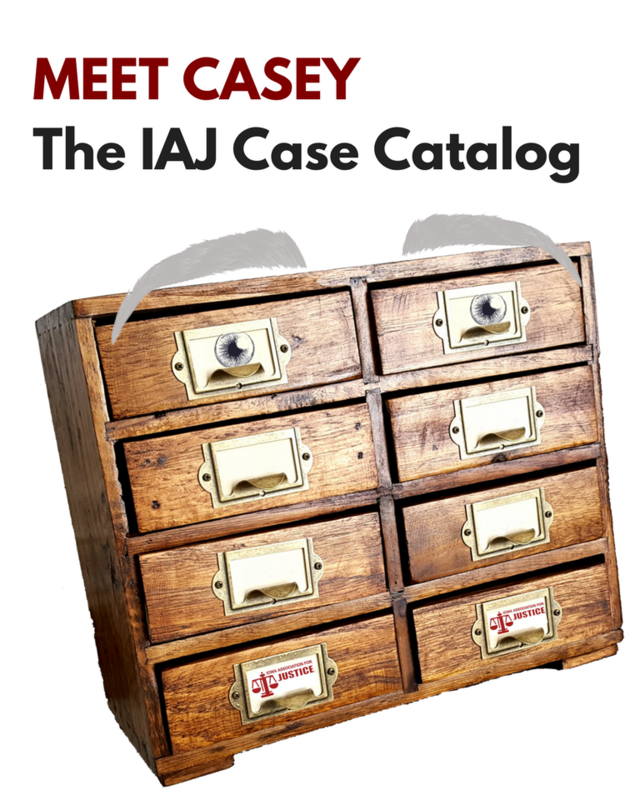 Follow the link above for a slideshow of IAJ's September Justice in Deed project in Cedar Rapids. As a part of Tim Semelroth's presidential outing in September, IAJ members gathered from around the state to give a day of service to families and businesses affected by the floods in Cedar Rapids. These attorneys mucked and gutted a residential home that had not been touched since the waters had receded, except as a waste dump. Then, they stripped the drywall and flooring from a downtown business that is soon to be remodeled. Click here to see IAJ photos from 2008. IAJ's public education and community service arm, the Iowa civil Justice Foundation, provided free safety helmets for hundreds of Iowa kids in 2008, a tradition that proudly continues today. Letters of thanks poured into the IAJ office from around the state, including one from Mrs. Haley’s elementary class at the Tipton Community Schools. One of the school kids, Denver Wallace, said it best of all (pictured). You’re welcome, Denver! Live long and grow strong.